Hummingbird in progress. 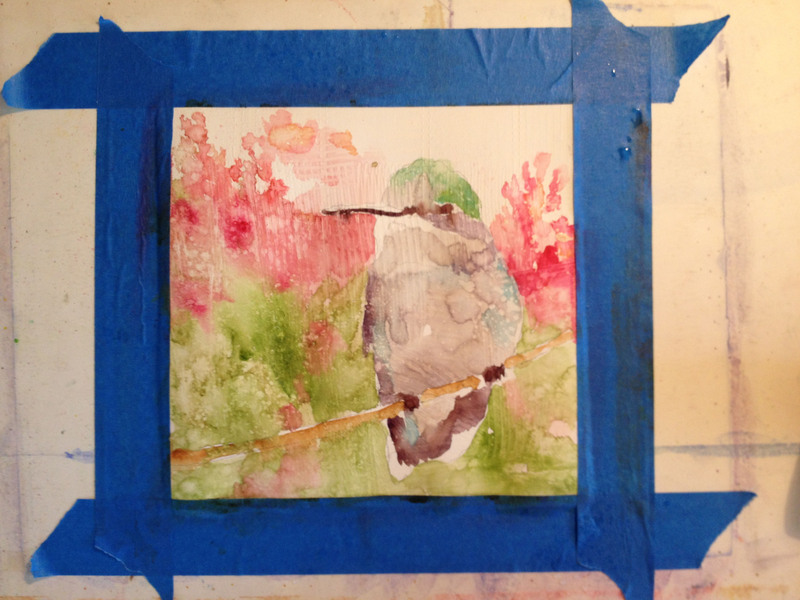 First wash. You will notice how much more the hummingbird “pops” in the final painting, due to darkening the values behind the bird. Hummingbird, A Moment. Final. 8×8 watercolor on gessoed watercolor paper. My cute little hummingbird. Even though I have them here in Oregon, they always remind me of Colorado. Mom and Dad’s place. Anyhoo, she’s available today only for $30, usually $50. Original watercolor painting on 140# gessoed watercolor paper. See that cool texture in there? That’s the textured gesso underpainting. This painting is 8×8, matted to fit into a 12×12 frame. Shipping not included. Unframed. Visit my store or stop by to see me and friend me on Facebook for upcoming events and special deals. Also, FOLLOW ME, will ya? You get an email only when I post, which is usually twice a week, and you won’t miss any of these fabulous paintings. Just scroll to the bottom of this post, click on FOLLOW, and add your email. Easy-peasy. Have a great Thursday, everyone! Oh, and leave a comment…what should I paint next? Right?!! Get me a good photo and permission to use it and I’ll do it. Strong directional light works best. 🙂 Thanks for liking my work! This is so beautiful you did an amazing job! It would be awesome to see some of the original photos too, but you bring such a feeling to it that no photo could describe. I think it would look really cool if you painted smoke coming out of a pipe. I feel like you could make it look fantastic! Any time, I love your work! Good, if you try it I can’t wait to see your take on it! Thank you! I’ll let you know when I do! Love it.It has very abstract feel to it . Thank you so much! 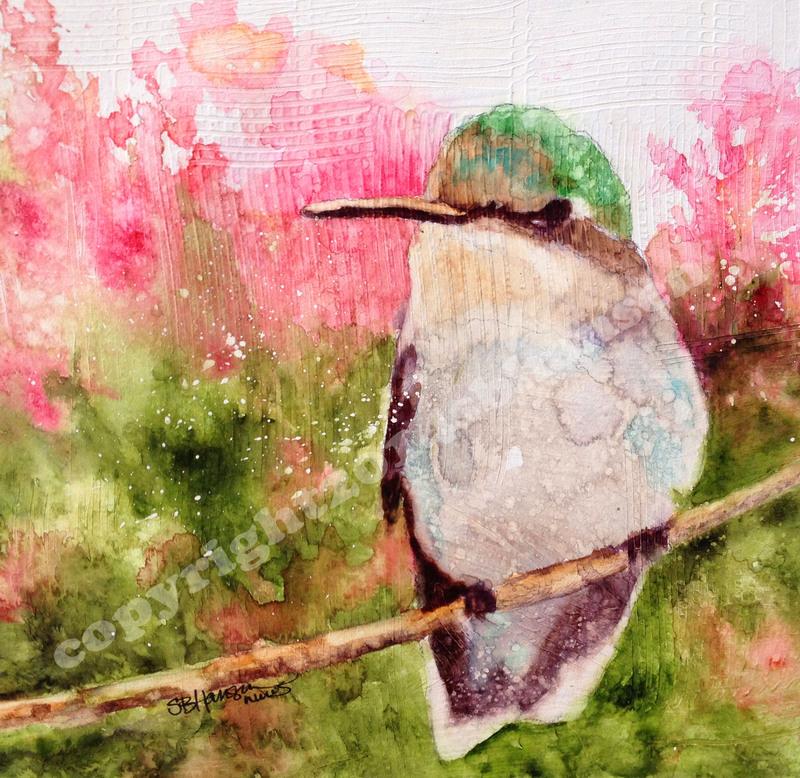 I completely invented the background, which I think we interpret as flowers, not only because of the color but also because this is a hummingbird painting and hummingbirds always hang out near flowers!